(Bloomberg) -- Not all of Goldman Sachs Asset Management’s fixed income clients chose to follow the plan by Bloomberg Barclays to add Chinese domestic bonds to its global index. While most clients are interested in the inclusion of the nation’s securities in the gauge, some declined to participate in the process that began Monday, said Andrew Francis Wilson, co-head of global fixed income at the money manager. Difficulty in moving between the onshore and offshore markets, as well as caution around the trade dispute with the U.S., prompted some clients to hold off, Wilson said. 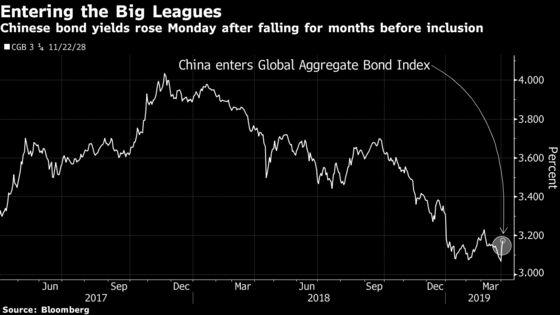 Bloomberg Barclays began adding Chinese onshore government bonds to its flagship Global Aggregate Bond Index in a 20-month process. Some global investors have expressed caution about the inclusion of China’s $13 trillion domestic bond market into global benchmarks issued by Bloomberg Barclays, JPMorgan Chase & Co. and FTSE Russell. Still, volumes have begun to perk up. Hong Kong Exchanges & Clearing Ltd. said in a statement that turnover through its Bond Connect trading link was 7.8 billion yuan on Monday. That compares with an average daily turnover of 6 billion yuan in the first quarter of the year. Bloomberg Barclays and Bloomberg News are owned by Bloomberg LP.